On Tuesday, Democrat Susan Wild, Republican Marty Nothstein, and Libertarian Tim Silfies participated in a debate hosted by the Greater Lehigh Valley Chamber of Commerce. The debate between the candidates for the newly drawn 7th Congressional district open seat will air on WFMZ’s Business Matters in two parts on Oct. 15 and 22 at 7:30 pm. The candidates discussed a wide variety of hot button issues including the current state of the economy, the nomination of Brett Kavanaugh to the Supreme Court, marijuana legalization and more. Nothstein believes the economy is currently in a good state and believes electing Democrats will reverse this progress. Wild believes the economy is not benefiting everyone as of now and vouched for a gradual increase of a $15 an hour minimum wage, immigration reform, legalization of marijuana and background checks for gun owners. On the economy, the Libertarian candidate stated he believes the federal government needs to make balancing the budget a priority saying they are “spending us into oblivion,” according to WFMZ. He also stated that he believes businesses will have a difficult time hiring more workers with an increase to the minimum wage. The candidates also expressed significant disagreements on how the confirmation process of Justice Brett Kavanaugh took place. Nothstein, who supported Kavanaugh’s appointment, believes the confirmation process was “an embarrassment” and felt sympathetic to Kavanaugh for having to answer the sexual assault allegations, according to the Morning Call. Nothstein was asked about the now-closed sexual assault misconduct investigation against him at the debate and said he “absolutely could relate” to Kavanaugh. “On Monday, Nothstein filed a lawsuit against The Morning Call and the nonprofit that runs the velodrome and the president of its board of directors, alleging that the article invaded his privacy and was intended to influence the election,” the Morning Call reports. Wild expressed sympathy for Christine Blasey Ford and took a shot at Nothstein for in her eyes not showing sorrow for her situation. When Wild was asked about impeaching Justice Kavanaugh, but expressed that was not a good idea. “I’m really not interested in a two-year distraction process known as impeachment of anybody,” Wild said according to the Morning Call. Silfies believed both the Republicans and Democrats are at fault for what played out during the hearing, “saying they were willing to rip apart Kavanaugh and Ford “because they wanted to win,” according to the Morning Call. On marijuana legalization, Wild advocated for it to become legal, citing the revenue it could produce, but stated it would need regulations. “She also called for the expansion of medical marijuana so that those being treated in veterans hospitals could use it,” according to the Morning Call. Silfies called for legalizing marijuana and an pushed for the overall war on drugs. He detailed a story of a friend dying of a heroin overdose and believes drug addiction should be treated as a health issue as opposed more so than a crime, according to the Morning Call. Nothstein advocated for the full support of medical marijuana, but doesn’t believe it should be legal for recreational use yet. “Right now I cannot support legalizing marijuana for recreational use,” he said according to the Morning Call. For further in-depth coverage, here are the links to the debate recap from various news outlets. 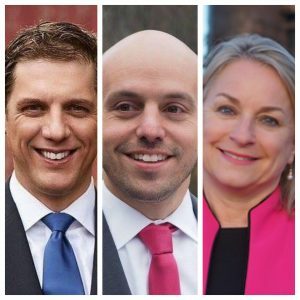 These three are also running in a special for the former CD15, which Charlie Dent vacated. I will be voting in that race. From what I see here, I agree with none of them on all issues, of course, as there is no perfect candidate. But this Dem agrees most with Silfies. I’m leaning his way. I wish they would debate closer to Hershey. Yeah sick dude, throw your vote away. Might as well write in Bob Doll. Poison’s bassist is running? Cool, maybe I’ll check him out. Or better yet, I could just blindly do what the two corrupt corporately owned parties shove down my throat. That way I get to “win” and get what I don’t want. Great idea. You should keep doing that.